So it begins. I may have mentioned yesterday that I slow-cooked a pork shoulder roast on Sunday, so we will officially be eating pork for the next week. I mean there’s only two of us and this roast was over 7 pounds! It’s really horrible of me to complain though. The pork came out so delicious, and I knew that for my first dish I had to go above and beyond just a regular pulled pork sandwich. In today’s post we put together a pulled pork grilled cheese. 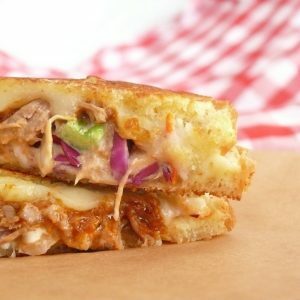 Who knew that grilled cheese can taste even better with pulled pork and homemade slaw! I mean I love it all by it’s lonesome, but the pork and slaw take it to a whole new level. A level that has gone straight to the moon and hasn’t even returned yet! Yup, it’s pretty much that amazing. We paired it with Boulevard Brewing’s Bully Porter (we are on quite the Boulevard kick here lately), and the pairing could not have gone more perfectly. Pork shoulder roast is one of those cuts of meat that when treated correctly, can be one of the most perfect cuts of meat out there. It gets a bad rap sometimes, and I don’t get it. It’s all in the preparation. You aren’t going to get a perfectly cooked pork shoulder roast if you cook it quickly. It HAS to be cooked low and slow to really get that great flavor and that “fall of the bone” effect. The great thing about making pulled pork is that it takes almost no hands on time. It just takes a while to cook is all, and if you own a slow cooker (this can also be cooked in the oven on low heat) then you can start it when you leave for work and it will be done by the time you get home. That sounds pretty great to me. These sandwiches are the perfect weeknight meal. Once the pork is cooked, the rest is child’s play. It’s perfect with tomato soup, so I suggest going this route. Unless it’s 100 degrees F outside. Don’t do that. As for beer, we are in love with Boulevard Brewing lately. We picked up a sampler pack at the store on Sunday, and we were pleasantly surprised to find that instead of giving you 3 of 4 different types of beer they give you 2 of 6 different types of beer! This is such a great idea! I don’t know why more breweries don’t do it. The Bully Porter was inside. It is a great, solid porter, and porters go great with dishes like pulled pork. If you’re feeling extra courageous, sub the beer in for the chicken broth in this recipe. You will really add some depths of flavor if you go that route! I hope everyone is surviving the week! I wish I could tell you that it’s almost over, but here we are. Have a great Tuesday everyone! Grilled cheese doesn''t have to be just cheese and bread. Spruce it up a bit with some pulled pork and cole slaw! You will be so glad you did! Preheat your slow cooker (4 hours at high heat; 8 hours at low heat). In a small bowl, combine the chili powder, brown sugar, cayenne pepper, salt, pepper and garlic powder. Rub the pork shoulder with the rub on all sides. Layer about half of the red onions into the bottom of the slow cooker and carefully lay the pork shoulder on top. Top with the rest of the onion slices. Pour the chicken broth over top and cook the pork shoulder for 8 hours at low heat (or 4 hours at high heat), or until the meat is falling off the bone. Once the pork has cooked, remove from the slow cooker and transfer to a cutting board. Discard of any juices left in the slow cooker, but leave the slow cooker on. "Pull" the pork apart using two forks (or your fingers) and transfer back to the slow cooker. Add the BBQ sauce and stir to combine. Cook for another hour or two on low. While the pork is slow cooking, prepare your slaw. Combine the cabbages, carrots, pepper and onion in a large bowl. Set aside. In another bowl, whisk together the mayo, mustard, sour cream, sugar,vinegar, salt, black pepper, cayenne pepper and hot sauce. Mix the dressing into the large bowl with the veggies until it is completely combined. Add the fresh cilantro and stir until incorporated. Cover and refrigerate for 2-4 hours before serving. To make the sandwiches, preheat a griddle over medium heat. Spread butter on one side of bread and lay the bread, butter side-down onto the griddle. Top the bread with cheese, pulled pork and slaw. Top with another slice of buttered bread, butter side up and cook for 3-4 minutes on each side, or until the cheese has melted and the bread is golden brown. Remove from heat and let sit for 4-5 minutes. Serve warm with extra BBQ sauce on the side and enjoy! Holy smokes that looks amazing. Your photography is pretty stellar. I could fall right through my laptop and devour that, lol.